Sci-fi is very in fashion at megagames at the moment. I attended the amazing Crisis in Elysium last month. We had four sci-fi games pitched for the Pennines 2018 Calendar (now released, btw!). And last weekend I went to A World Divided, my first ever Southwest Megagames game. The setting was the American Revolution… in space! In the year 2411, eleven colonies on the distant planet of Rosal were considering breaking away from the Federated Atlantic Syndicate (FAS). A group of unelected dignitaries from the colonies had formed the Rosal Assembly, to discuss and determine the exact route to independence. Both sides would be trying to get the initially neutral colonies to declare for them. Also, to cause chaos, the First Settlers (totally not Native Americans) were nearby, raiding our territories and causing chaos. I hadn’t planned on going to this game. In fact, I was determined not to. Fourteen megagames in a year was enough, I told myself. But then I found out that a whole host of my friends from uni were going… and well, it would have been rude not to. I headed up the colony team of Macmahon as Chancellor. Mine was one of the smaller colony teams, and I had just two team mates – Ben as my Security Head, and Louis as my Diplomat. We were thematically based on Virginia, and had bountiful visidium mines (which I guessed was a parallel to the tobacco trade). We had long been on good terms with the FAS, but more recently they’d been screwing us over in trade negotiations. On the other hand, we relied on them to defend us from First Settler raids. Retain our power and influence, and make use of the uncertain situation to get more. Expand our territory and keep colonising. Protect the economy, particularly with regards to the visidium trade. Initially, I was pretty set on sticking with the FAS. But I was happy to use the situation to my advantage to leverage some better trade terms. Eventually we worked it out, and both myself and my diplomat stayed home to deal with the influx of visitors! It seemed that everyone wanted our visidium! We had envoys from both C. Orlando and Antun asking for prices, but I didn’t really have a clue what the in-game value would be. More importantly, we needed to keep hold of our first two turns supply to make a TaCCo (colonisation unit), to help us expand further north. Meanwhile, Louis was chatting to our Rosal Assembly. The status of the Assembly was pretty confusing to me. These people were random people who’d decided to get together and discuss things and pretend it was all official. They weren’t elected! Or appointed by our government! They were just random independence people! Nevertheless, I was going to use the situation to my advantage, and we presented him with a list of requirements. I also made sure I spoke to a representative on the FAS to make a similar list of demands. My contact with the FAS throughout the entire game was by phone, and it wasn’t until the debrief that I found out who I’d been chatting to. Reduced trade tariffs (we started the game with a 2 megacredit tax payment each turn to the FAS). Protection from any surrounding colonies who end up declaring for the opposing side. Assistance in dealing with the First Settlers. Ah yes, those pesky first settlers. Luckily, one of my best friends, Symonds, was playing the leader of the First Settler clan closest to our borders. They attacked us turn one, but rules mishaps meant the attack was delayed until the second turn, giving me time to reason with him. “We need your HVMs!” he told me. HVMs are High-Versatility Materials, basically technical components that the First Traders use instead of money. And, more crucially, try to steal from us on raids. Symonds told me frankly that if he didn’t get enough HVMs each turn, his people would starve. It was a lot easier to be sympathetic to the First Settlers than historically it may have been to do so with the Native Americans. Their roots were as the first colonists to make it to Rosal, over 300 years earlier. They were the cream of Earth intelligence. But unfortunately Earth lost contact with them for over a century, and they had to learn to survive using the now-dated technology they landed with. While they were undoubtedly different to the newer colonists, the First Settler tribes were clearly very intelligent, spoke the same language, and were easy to respect. This realisation brought me to one of the underlying themes that shaped the game for me. I would not let the First Settlers starve. I went about trying to source some HVMs as quickly as possible. We were hit with a turn of raiding, but then I negotiated a payment of two HVMs per turn to the Keww’Ay tribe, in return for no raids. The HVMs were difficult to source, and honestly took up a huge amount of my time and resources. I heard back from both the Assembly and the FAS pretty quickly. The FAS offered a short-term 50% discount in taxes, for just two turns, while the Assembly promised long-term taxes of the same amount. Finally, on the topic of First Settlers, the FAS said vaguely that they were happy for us to negotiate with them. The Assembly alleged that the First Settlers were on the brink of signing an agreement with them, to not target any Rosal-declared colonies. Well, I already had made my own peace with the Keww’Ay. And the other First Settlers certainly weren’t acting like peace was on the table – the Arendi had just started attacking! The FAS confirmed they would defend us proactively from any Rosal Assembly allegiants, while the Assembly made vague promises. Their plan involved stationing the First Settlers within our colonies to defend us. Well, it was largely the First Settlers we needed defence from! We decided to stay neutral for the time being. Meanwhile, the group that I expected would be my greatest challenge all day were actually proving the most reasonable. I had managed to supply the Keww’Ay with their much-needed HVMs for a few turns, but my funds were running low and it was getting in the way of progressing my colony in a meaningful way. In a discussion with Symonds, he claimed the First Settlers were in this trouble because we’d forced them north, into less fertile land. The solution seemed obvious to me – give them some land back! I offered them the township of Halsall, one of our northern territories. The hope was that, with access to good land, the First Settlers could support themselves. It was a controversial decision, of course – many of my populus were not pleased about the idea of sharing space with the First Settlers. Initially I hoped for a peaceful resolution, and started a propaganda campaign showing the benefits of living alongside our colonial predecessors. Unfortunately, to quell uprisings, we needed to turn to military intervention, but I tried to keep it at a minimum. Early on we’d set up a WhatsApp group for the leaders of each party to chat in. At the start of turn 4, I suggested we form a Committee of Leaders, as a contrast to the unelected random group that seemed to be leading the charge away from the FAS. In my mind, this could be a way to find a more moderate route to independence, that wouldn’t isolate Macmahon from the FAS trade routes. The head of the Colony of New Springs pounced on the idea and organised a meeting in C. Orlando. Unfortunately the meeting was utter chaos, with reps from every single group at the game. Negotiations tumbled to a halt as people spent a long time complaining that we were doing too much talking and not enough action. I tried to organise another meeting, hoping we’d get more done if just the colony leaders turned up. But my WhatsApp messages fell on dead ears. Clearly I’d need to seize control in another way. I made it clear to the Rosal Assembly that their unelected status gave them no authority, in my opinion. However, if they transferred over to a fully elected commission, I’d be willing to declare for them. For weeks, they delayed, refusing to make any public statement. In the end, I conducted my own election, aiming to replace my council rep with my diplomat. I threw money into the campaign, but unfortunately my current rep was the known quantity and won out. Blast. I visited many of the other colonies, asking them to follow in my footsteps. For the colonies that had declared for the FAS, I suggested they push hard to get their own FAS-friendly diplomats elected. And I called up the FAS to give them warning. I promise that I wasn’t declaring against them – instead I was hoping that, on the inside, I could work to bring the Assembly around. Then I stood up and declared for the Rosal Assembly. My declaration coincided with some raids by the Arendi First Settlers. And our lack of further colonisation – agreed willingly with the First Settlers – meant that our new immigrants were struggling to fit in our colony. All together, it tanked our economy score. I reached out to the Assembly, asking for financial assistance. In return, we offered to host them at our capital city of Solingen. It was located further north than the other capitals, out of the “Strip”, an area of dust-free airspace that made it easy for spaceships to launch orbital strikes. Here, they hoped, they’d be safer. I also informed my Assembly rep that, as an elected Macmahon official, he was expected to visit us every team time, rather than spend the entire period in Assembly. He generously offered to cover our “fee” to be on the Assembly (that I didn’t even know existed) from his own pocket, which thankfully added to our economy rating. I also chose to reduce our immigration. Control told me it wouldn’t be a popular decision long term, but I didn’t know whether I’d keep it up long term. I just knew that it was the only option right now. But the Arendi weren’t letting up. I needed to find a new way to deal with them. Through Symonds, I got an introduction to the Arendi leader. I offered him some HVMs, and he asked about the possibility of buying a TaCCo from us, to colonise some of the land further north for his people. I eagerly agreed, seeing all kinds of possibilities. Halsall was settling down and finally providing the Keww’Ay with a good income. It seems that colonists and First Settlers could live together, if we tried! The agreement was, we would have a Macmahon quarter in the new settlement, and we would give them a First Settlers quarter in one of our existing cities, Jena. Things finally seemed to be turning around, and a few turns later we agreed a similar deal with our good friends, the Keww’Ays. We were really leading Rosal into a new era, where First Settlers and colonists worked hand in hand. To this end, we created the first ever joint First Settler-Macmahon University! Finally, it seemed our problems were coming to an end. It was noted that my colony was one of very few Assembly-declared colonies that hadn’t been attacked by the FAS. Even our undeclared neighbour, Antun, was currently being stormed by their troops. But mine was being left suspiciously alone. Meanwhile, my team mates came to me with a proposition. The Rosal Assembly had been within our city for a couple of turns now. They had none of their own troops with them – on the contrary, some of Macmahon’s armies were currently guarding them. Realistically, we had them completely at our mercy, pointed out Louis and Ben. Initially, I only reached out to the FAS for security purposes. If they thought we were going to betray the Assembly, they may leave us alone for a few more turns – long enough for our economy to recover, at least. I asked for money – they would expect that, no one does anything for free – but to show willing I didn’t ask for it immediately. Instead I promised to call back when I had more information. I left it for a turn. Next, I heard that the Rosal Assembly were considering vacating our city for somewhere safer. This threw me into a frenzy, and I immediately started coming up with reasons as to why it was a good idea. Chief among them: with the largely still unelected Rosal Assembly dead, I could take the lead in organising the replacement. I spoke to Control about it, and paid a pretty penny to keep all plans secret. There was just one problem – a player overheard. Despite my best efforts, you can’t control stuff like that. But at this point, I had no idea. Then I tried to go back to the FAS to up my fee. I was going to ask for 10 megacredits, 5 visidium crystals, 5 HVMs and 5 weapons. But there was one problem. He wouldn’t answer the damn phone. With every second that passed, I felt my chance slipping away from me. I called again and again. I didn’t want to text – I didn’t want to leave a record. Finally he answered. He sounded stressed, and I could barely make out what he said. But I did manage to hear, “sorry, I can’t talk, I don’t want to go to prison for war crimes”. Even more panicked, I rushed to my Rosal Assembly rep. Completely bullshitting, I told them we’d suffered a serious cyber attack, that we believed it was from the FAS, and that they should move bases ASAP. Next, I announced the “failed” cyber attack, blaming it all on the FAS. I don’t know what comms were like on that team, but chances are at least a couple of them thought that they might actually have done it, knowing megagames. But rumours were still going around. Symonds of the Keww’Ay came up to me and mysteriously said “I don’t know what you’re doing, but go for it!”. And worst of all, the press announced that they’d received an anonymous tip off that I was secretly working with the FAS. That was it. I needed to find a way to get us off the hook once and for all. And I knew how to do it. 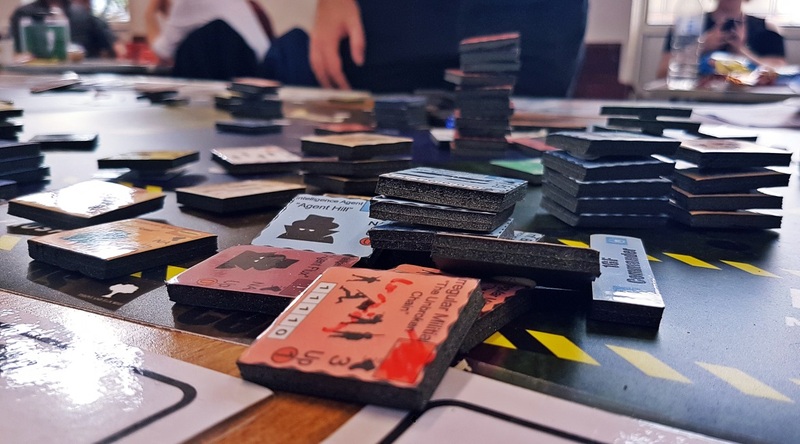 I think this goes down in history as the first time anyone at a megagame has asked Control to deliberately bomb an empty room. Yes, the room that the Rosal Assembly had just vacated. And I paid a ridiculous amount of money to do it too. Following the game, it all came out that the FAS hadn’t been the leak after all. When he answered the phone, he was actually telling me that, due to something completely unrelated, he was being arrested for war crimes. It had nothing to do with me or Macmahon. Instead, the leak was just pure dumb luck – someone standing around a corner at the wrong time. Thanks John Mizon for a very fun and entertaining game. Swindon is a long long way away, but it was worth the trip. My next megagame is Red Dawn? in London on 21st October, the game of the Russian Revolution where I’ll be playing a member of the Russian secret police.